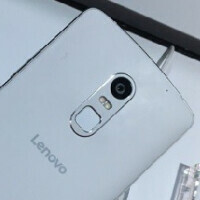 The Lenovo Vibe X3 has been certified by TENAA, and benchmarked by GeekBench. Now, the handset has posed for photographs during the China Telecommunications Exhibition. This is apparently the same exact phone, code named Lemon X, that we told you about earlier today as being one of the first Lenovo handsets to incorporate design cues from Motorola. As we told you last month, Lenovo is now counting on Motorola to design and manufacture its handsets. There are at least two variants of this phone, both of which have been certified by TENAA. One model has a flash to the side of the rear camera lens, while the other model has the flash directly underneath the camera and above the fingerprint sensor. The latter is the higher-end model of the Vibe X3, which was photographed at the Exhibition. This model features a 5.5-inch screen with extremely thin bezels, not just on the sides, but also on top and bottom. The resolution of the screen is 1080 x 1920, which works out to a 401ppi pixel density. The Snapdragon 808 SoC is under the hood, featuring a hexa-core CPU and the Adreno 418 GPU. 3GB of RAM is inside, along with 64GB of internal storage. A 21MP camera adorns the back of the unit, and an 8MP selfie snapper graces the front of the phone. Dual SIM, dual standby capabilities are offered, and the lights are kept on thanks to the 3500mAh juicer on board. Android 5.1 is pre-installed. We're not so sure that a new smartphone, or any product really, should use the code name of "Lemon." Leaving all that aside, the front-facing dual speakers, and the strip running down the back with the camera, flash and fingerprint scanner, do appear to have Motorola-esque qualities to them. Still have that ugly UI. Those black lines are bezels for crying aloud!!! Anyone that argues this point needs to check their IQ level. This is hardly any better than HTC phones when it comes to bezels. Phones with large bezels would never attract me as a buyer. Nice try twisting the facts here. Speakers are meaningless to me. I never use my phone as a music player or video player. All that place is wasted space IMHO and I know I am not alone with this argument. Good luck both to this phone or any HTC phone that I have zero interest in. Make a 5 inch version for Verizon and I'm sold! Vibe UI is just plain ugly. Of all the skin put out buy Chinese manufacturers, the flyme OS is the better looking imo. Why arn't they making phones like Vibe Z2 Pro?